Welcome on arrival, TG or MAI flight, at Yangon Airport. Transfer to hotel. Dinner at a reputable restaurant. Overnight in Yangon. After early breakfast, transfer to airport for domestic flight to Nyaung U. It takes about an hour and ten minutes flight. On arrival, transfer to Hotel and proceed for sightseeing. First visit to Nyaung U Market where various kinds of local products and local people can be seen. Then visit to Shwesigon Pagoda, built by King Anawrahta in the early 11th century as the first Buddhist building built in Myanmar style. Continue to the ancient city of Bagan, which had been the Capital of First Myanmar Empire during 11th - 13th century. Over 2000 well - preserved pagodas and another 1000 ruined pagodas are scattering in the city area of 42 sq km. Visit to Ananda Temple, which has four huge Buddha Images in standing position and relieves depicting the Buddha from his birth to his Enlightenment. Next visit is to Thatbyinnyu Temple, the highest white stucco building in Bagan. After lunch, continues sightseeing to in and around Bagan. 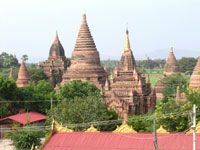 Visiting places include Dhamayangyi, Bagan's most massive temple; Shwesandaw Pagoda, with five terraces, built in 1057; Manuha Temple, from the 1059, in the Mon Style; and Nanpaya Temple, said to be the place of King Manuha's palace site. Also, visit the Lacquer ware workshops in Myinkaba village. Watch Sunset over the Ayeyarwaddy River from Bupaya Pagoda on the riverbank. Dinner and overnight in Bagan. After breakfast, deport Bagan for journey by road to Mt. Victoria. After arrive in Chauk, on the eastern bank of Ayeyarwaddy River, drive through the Anawrahta Bridge across the river and arrive Seikphyu, a little town on the western bank. After lunch at Seikphyu, drive along the mountain-road through the Chin Hills. Natural scenes of the forests on of the Chin Hills are terrific. Arrive at Kanpetlet, a small town in Chin State. Dinner and overnight at Kanpetlet. After breakfast, drive up to the mountain-base of Mt. Victoria. Proceeds by trekking to the mountain top, 3109 metres high. You can see rare species of plants, trees and birds on the mountain. Camp on Mt. Victoria. Climb down the Mt. Victoria and return drive to Kanpetlet. Dinner and overnight at Kanpetlet. Depart Kanpetlet for return trip by motor-road via Saw, Seikphyu and Chauk townships. Lunch en route. Arrive late in the evening in Pyay. Check-in hotel. Dinner and overnight in Pyay. Sightseeing in Pyay. 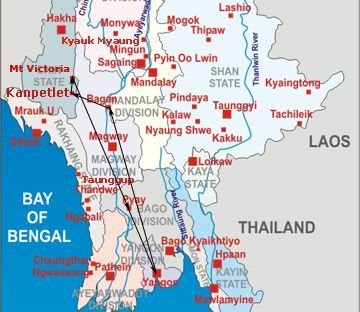 Pyay is an important commercial center locating on the Eastern bank of Ayeyarwaddy River. Visiting places in Pyay are; Shwe San Daw Pagoda, landmark of the downtown area of Pyay, Se Htat Gyi, a huge Buddha Image in sitting posture and Neik-bein-Da hills, a retreat for the Buddhists. After lunch, drive back to Yangon by motor-road which takes about 6 hours (161km). Dinner and overnight in Yangon. After breakfast, transfer to airport for return flight to Yangon. Visit to Shwedagon Pagoda, the landmark of Yangon and one of the world's most spectacular religious monuments. It is said to be built over 2000 years ago enshrining the hair relics of Buddha. Continue to Chauk Htat Gyi, to see the huge reclining Buddha Image and then to gilded Sule Pagoda, over 2000 years old, and still stands as the landmark of Yangon City Center. Proceed to Bogyoke (Scott) Market where hundreds of stalls of souvenirs and handicraft shops can be visited. After Lunch, visit the National Museum to see the 8 meters high Golden Lion Throne and Mandalay Palace Royal Regalia, utensils, manuscripts, etc. Evening transfer to Yangon Airport for Departure. In the above adventure tour, we can hike up the Mt. Victoria, the highest Mountain- top in Chin Hills and can also visit the Chin tribe villages to see their traditions, culture and daily lifestyle.